“Mighty oaks from little acorns grow”. So it is with tennis players. Tennis uses more fine motor skills than other sports, and these need to be developed from a very young age. Whether your child aspires to becoming an elite tennis player, or whether he or she just wants to learn the game, starting them young with kids tennis lessons is the first step. Is Tennis Right for my Child? Given all the other sports available to children, you may wonder why you should sign your child up for tennis lessons. The reasons are both compelling and multi-faceted. And most important of all, tennis is fun! At kids’ tennis academies around the country, increasingly more children are discovering a love of tennis at an early age and learning the skills and discipline that the game entails. Youth tennis has been evolving and is now on a revolutionary, kid-friendly path. Today, kids tennis lessons incorporate changes that make the game less daunting for very small children especially. The United States Tennis Association (USTA) launched Net Generation at this year’s U.S. Open. The goal is to make tennis much more accessible to more children than ever before. Younger children now train on shorter courts, and they use smaller, lighter rackets and lower-bouncing balls. These changes mean that children learn the game more easily — and in quicker time. The USTA also aims to promote tennis as a platform through which each child can proclaim and extol his or her individuality and the expression of self. 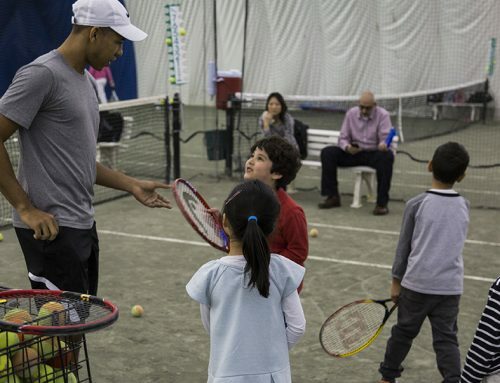 Furthermore, to ensure a safe tennis environment for your child, USTA require that all Net Generation coaches, volunteers, teachers and players must participate in their Safe Play Program. The program is a three-step process that includes background checks. Ultimately, tennis engages children on a physical, social and psychological level. In playing the game, your child will build a strong, healthy body and a disciplined mind. Tennis engenders a sense of self-sufficiency that no other sport offers, and the lessons will inform and shape all aspects of children’s lives as they grow to maturity, no matter what career paths they eventually follow.